The LG G5 is a product of bold and fresh ideas. It has the looks of a brand new flagship, the heart of a dragon and an adventurous dual camera setup suited for every occasion. But there's more than what meets the eye, the Magic Slot. 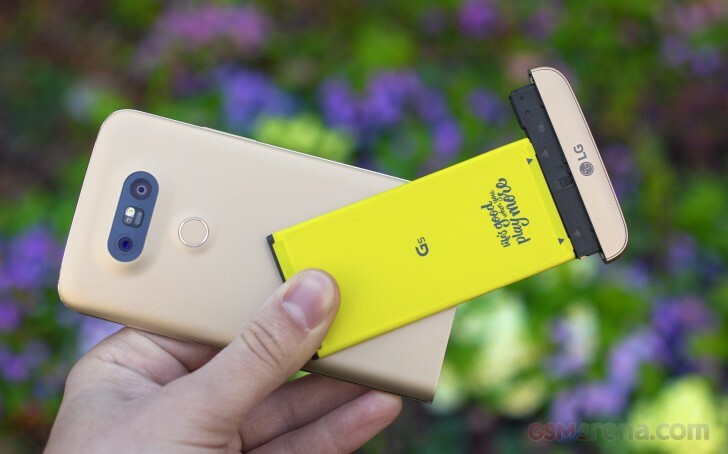 The LG G5 is a modular smartphone, which lets you plug a handful of external add-ons: a semi-pro camera grip with shutter buttons and a bigger battery, or an external sound amplifier by B&O. The LG G5 takes a break from the familiar G-series design, losing the signature rear deck with lock and volume keys and returning to the elegant, rounded shape. We like what LG has done with the G5 - the metal shell suits the flagship while the front 3D Arc Glass is unlike anything we've seen so far. The glass spreads across the entire front of the device and is flat throughout except at the top where it curves towards the metal frame. It's quite subtle yet makes for a classy effect regardless of the angle at which you are examining the G5. The chassis is a metal unibody, but the fact that it's painted caused much controversy among users who attempted to scratch the external finish only to find something that looks like plastic underneath. It turned out that paint and an underlayer of primer were both used to hide the unsightly plastic antenna bands running across the otherwise aluminum shell. Popping out the original battery from the Magic Slot is quite easy and you can insert whatever new accessory you have. It does power off your G5; there's no way around it. Good thing is the G5 is one of the quickest phones to boot, which limits the waiting after that. 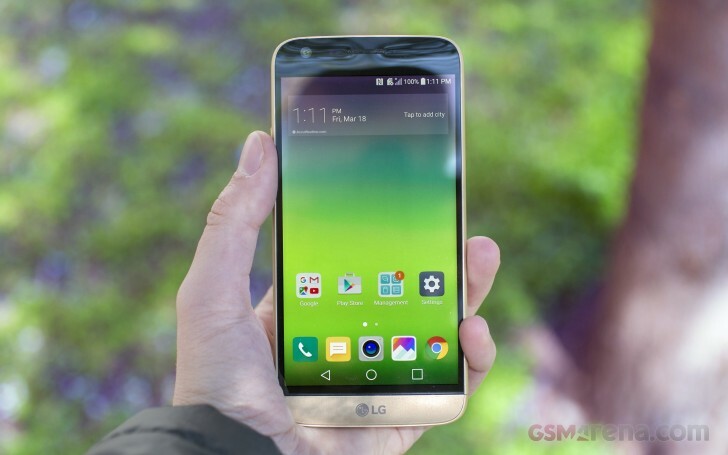 The LG G5 has a screen similar to the one used on the V10, but smaller. It's a 5.3" Quantum IPS LCD unit of Quad HD resolution. This results into a 554ppi screen density. The screen of the LG G5 has an impressively high contrast ratio (1885:1) due to its unusually deep blacks (deep for an LCD anyway). However, we measured the maximum brightness to be surprisingly low at 306nits. It's a good thing that at least in auto brightness mode, the phone is able to push it up to 378nits in response to bright ambient light. Resolution: 1440 x 2560px What's this? In the opposite end of the brightness slider, the LG G5 screen offers a pleasantly low minimum brightness level of only 3.6nits (like the LG G4 and V10), which means it will go quite easy on the eyes when you use the phone in pitch dark settings. Regarding color accuracy, the screen is similar to the V10's, which means it doesn't have perfect color rendering, but it's above average and you would hardly notice anything out of the ordinary with your bare eyes. The LG G5 is powered by a 2,800 mAh battery, and the good news is you can easily swap batteries via the Magic Slot. If you have opted for the Camera Plus accessory, your total battery capacity will be 4,000 mAh. We did our test with the regular pre-installed battery, of course. The LG G5 is quick to charge thanks to the latest Qualcomm's Quick Charge 3.0 tech - with the right charger the phone's battery will fill up about 80% in just 30 minutes. Endurance rating: 60h What's this? The LG G5 did relatively well in our test with an endurance rating of 60 hours. Our endurance rating is the amount of time the G5 would last on a single charge if you were to use it for an hour of 3G calls, an hour of web browsing, and an hour of video playback each day and is just an indicative usage scenario, which we use for comparing battery life across devices. The Always On display feature takes its toll on the battery - less so than on the Galaxy S7, but the S7's AOD is quite brighter so that should count for something. The LG G5 delivered perfectly clean output in the first part of our audio test. When used with an active external amplifier, the flagship easily achieves top marks for clarity, which is about what you'd expect from a decent phone in 2016. The volume levels are slightly lower than average though, which puts the G5 at somewhat of a disadvantage over its direct rivals. The loudspeaker proved to be good - even better, with certain ringtones it was downright loud. Additionally, the speaker sound quality is among the best we've heard to date, with very rich and clear output. Even though it's a single speaker, it seems to be capable of dispersing the sound wider than most of the phones we usually encounter. 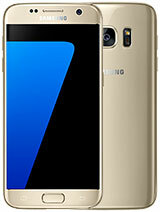 The new flagship now comes with a dual shooter setup on the back. You can capture the scene with either a 135-degree Ultra-Wide Angle camera or with a more conventional 75-degree field of view camera. The extra spatial awareness comes courtesy of an additional 8MP camera on the back. It sits alongside the main 16MP F/1.8 camera. And here are a few camera samples taken by the main 16MP camera, as well as a snapshot from the selfie camera. The image quality is quite impressive. The produced photos are rich in detail, with little noise to get in the way but come out with strong, artificial sharpening. The noise reduction can be too aggressive on some spots though, while it's helpless in other areas. The colors are fairly accurate, the contrast is very good, as is the dynamic range. While it's no HDR, it manages to capture more than enough detail in the shadows, while keeping the highlights in check. And here is a couple of samples shot by the secondary wide-angle camera. The quality is nowhere nearly the same and there is pronounced geometric distortion, but they give you an entirely new angle on any scene. 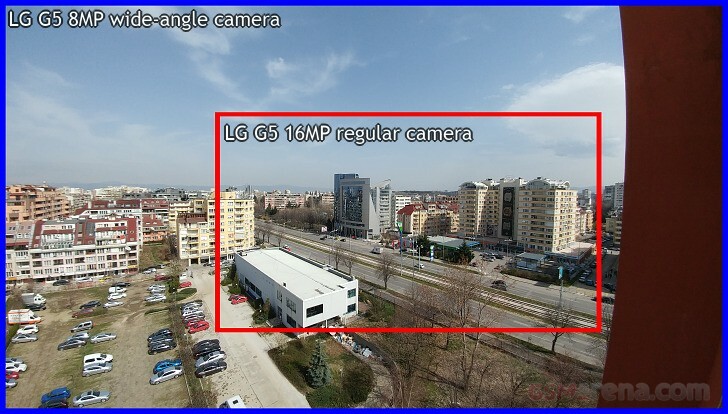 The LG G5 camera tops out at 4K @ 30fps video. There's no 1080p @ 60fps, while for slow motion you get 720p @ 120fps. The 4K videos have 48Mbps total bitrate. They are as smooth as 30fps videos can be and the image quality is excellent - plenty of detail, low noise. The colors are identical to the still photo camera, as is the dynamic range, white balance, and contrast. Overall - the 4K video samples taken with the LG G5 are among the better ones we've seen so far. 1080p videos are shot at 17Mbps, and the quality is great. At this resolution, you get the option to enable digital image stabilization, the Steady mode. However, this will shrink the field of view noticeably. But if you really need wide FOV, then just switch to the other camera - its samples are equally great though not as sharp towards the corners. Watch both samples from the playlist above. The latest G-series flagship has a tradition of bringing a new version of the LG UX, and we are up to v5.0 with the G5. It's built on top of Android 6.0.1 Marshmallow, and it brings new features as well as a cleaner look to get closer to the Material Design aesthetics. The lockscreen supports notifications and shortcuts, as usual. To unlock the phone, you can use double tap or LG's more secure Knock Code. However, the fingerprint reader is the most secure option. Since it's built inside the Power key, all you have to do is tap on it - the sensor is always on, and it works lightning fast. Your index finger (on either hand) naturally rests on the Power button, making this solution comfortably ambidextrous. The homescreens are the usual affair - they support shortcuts and widgets, you can change wallpapers and effects, and you can opt for the Smart Bulletin homescreen. The latter offers at-a-glance info from LG Health, upcoming calendar events, music controls, IR remotes, and Smart settings. The most notable change is perhaps the fact that by default, the phone UI lacks the app drawer we're used to seeing elsewhere on Android. Getting rid of the app launcher has been a growing trend among Chinese phone makers which are after a more iPhone-like UI and it seems LG is riding the same wave. Overall, we like the new Optimus 5.0, as it is organized better, got rid of some functionality, but kept its most important services. The result is an interface closer to its Android roots, yet recognizable and powerful. Basemark OS II 2.0: 2425 What's this? Basemark X: 27577 What's this? The LG G5 performance is flagship-grade, capable of handling anything anytime, and it doesn't heat the shell much. We ran lots of benchmarks, one after another, and the G5 chassis did get warm, but far from hot. While there are more attractive flagships than the LG G5 out there, we were impressed with the excellent build and handling. There's an excellent screen, an amazing camera, and a feature-rich software package. The battery life is acceptable even if average, and the swappable battery compensates for that. The Galaxy S7 is perhaps more attractive and even water-proof, but some may consider its 4:3 12MP camera as a downgrade. TouchWiz isn't everyone's cup of tea either, and the sealed battery may be a limiting factor to some. 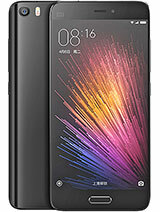 The Xiaomi Mi 5 is cheaper, but better looking alternative, while it's equally capable (save for the camera and the memory card/battery flexibility). The Mi 5 is also offered in just few markets, but if you are among the lucky ones, the omissions may as well be worth the price gap. Great speaker and vibrant screen but the worst for WiFi and streaming capability. I have a Hauawei that performs better with data services(streaming). I will never pay for an Lg product again... 40 plus years to go. Get the new guy but I'm done. Great innovation by LG. The LG G4 phone is great by spec. Hope to get one for my self.